Bhavani is only in the 5th grade but speaks about her life as if she was many years older. She lives with her grandparents and her mother in a small hut in her village in Madurai. Her mother works as a maid at neighboring houses and brings home leftovers when she can. Bhavani was barely a year old when her father left the village to work in Chennai. He has no permanent job, works wherever possible and sends home whatever money he earns. 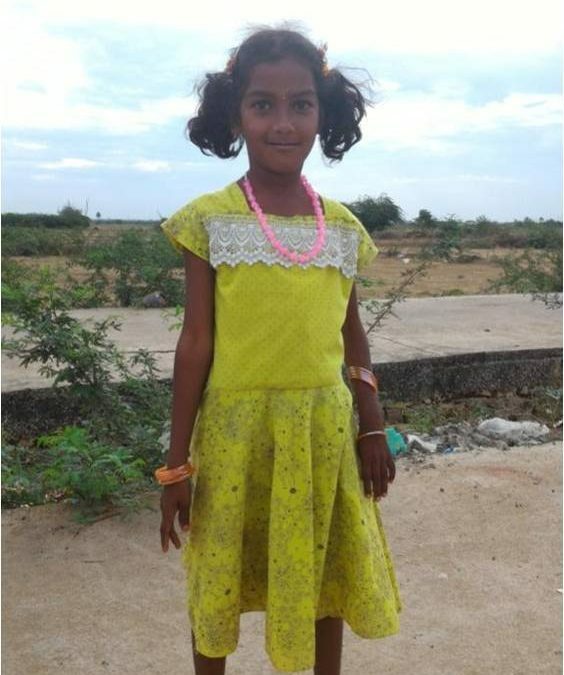 Bhavani seemed perfectly healthy when she was born but her family soon came to know that she had a skeletal limb abnormality. Her left arm is shorter than her right arm. Yet, Bhavani is not upset about her abnormality, even if it often gets in way when she tries lifting things with both hands. She says she has grown accustomed to it. Against great challenges, HoPE kids like Bhavani are on the road to success. Your generous contributions to HoPE Learning Centers make this possible. A monthly contribution of only $10 covers all expenses for one precious child. A monthly gift of $350 or a one-time donation of $4,200 helps 40 children like Bhavani survive, thrive and succeed!